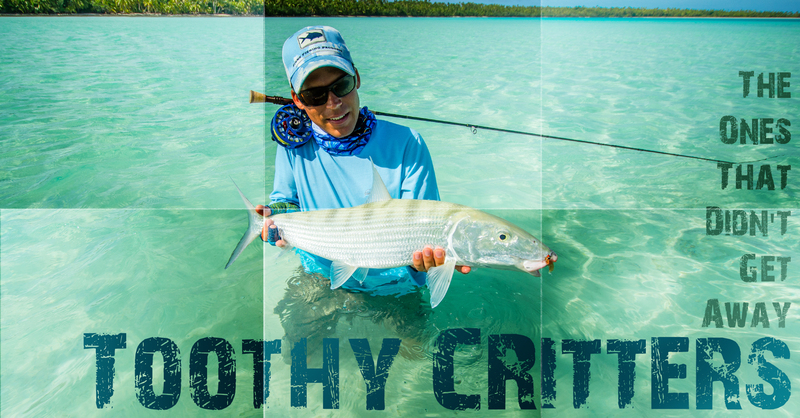 A big GT on the fly is what every saltwater fly fisherman is dreaming of. I’m fascinated of GT’s since I saw the a video about it on YouTube many years back. Its a brutal non-forgiving fish that you either can tame or he will show you who is the boss on the reef. There is no room for any mistakes and no GT will give you a second chance. GT in the surf… it can’t get any better! Already in 2014 I came to Aitutaki with the hope of a real big GT. I caught a really nice one but clearly not a monster, maybe 25 pounds and a fork length of 84cm. A solid fish that offers a breathtaking fight on a twelve weight fly rod. And then last year, on Anaa, the fish got bigger and I increased my personal best to 96cm. The magic +100cm should it be this year on Aitutaki. Never for a trip I was better prepared. Rods, Reels, Lines and Flies… everything was topnotch and ready for the one fish of a lifetime. Aitutaki is not treated as a prime GT destination. Its known for bonefish and thats also what many anglers are looking for. GTs are underrated on Aitutaki. 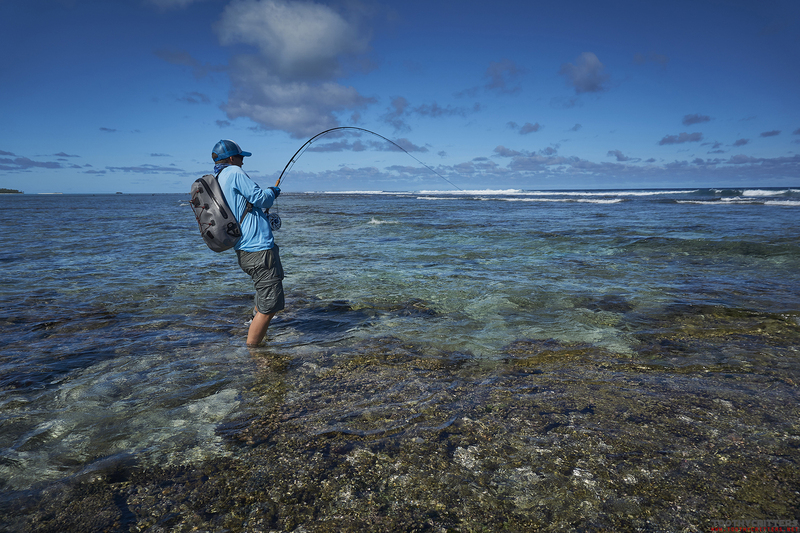 In fact Aitutaki doesn’t have as many spot as some other prime destinations where the real big ones can be spotted. 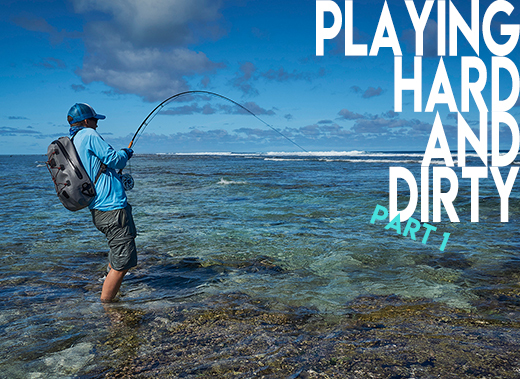 But this shouldn’t underrate the possibilities to catch a big GT on the fly on Aitutaki. In general you need patience for GTs. On one day you see no fish at all and then there are these days you see a group of GTs hunting in a pack. The guides know why and this is also the reason you are better going out with a guide. As well as the fact that you won’t reach the spots without. Spots is a good keyword. 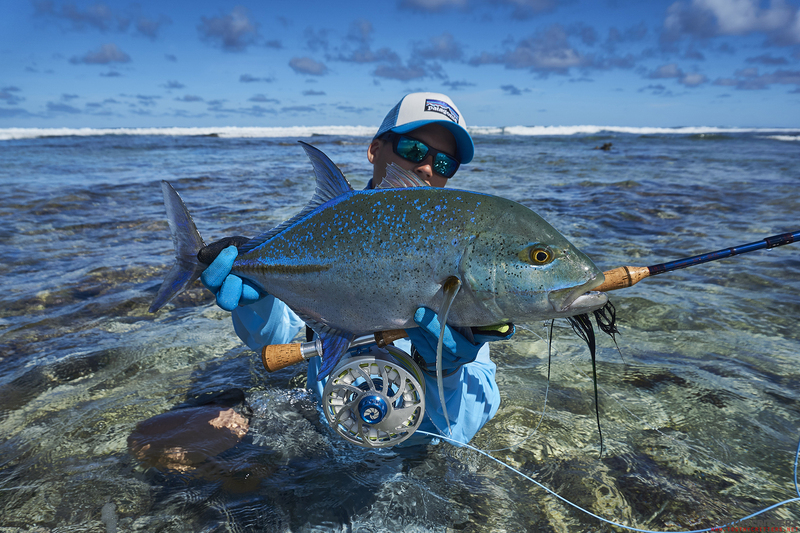 Aitutaki’s major spots to chase GTs are the reef cracks. 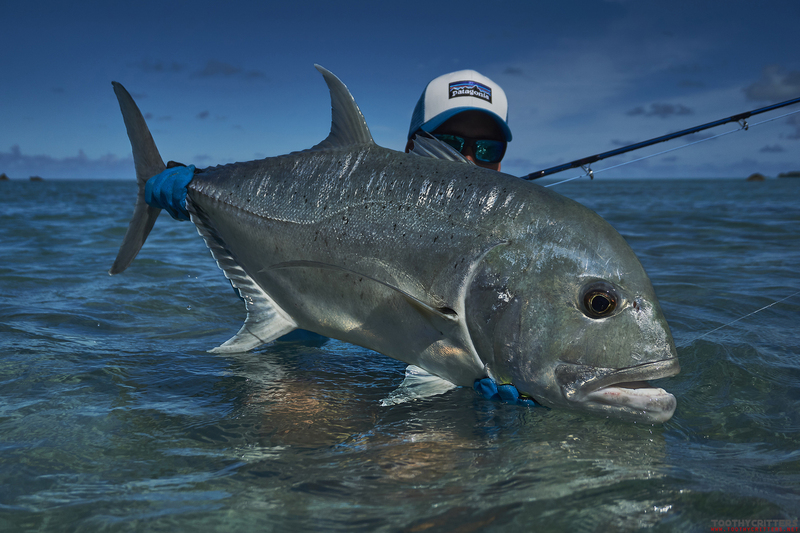 There are 6-7 bigger ones around the atoll and they are a magnet for any bigger predatory fish. Strong currents push fresh water into the lagoon what means food for baitfish and they itself mean food for the big boys. None of these spots are a walk in the park. Don’t misunderstood this reef cracks with big sandy inlets. This are as wild as it can be. Precipitous cracks in the reef and everything else than friendly to humans. We are not made for this environment. There is, depending on the tide, always a big current, that is as strong as a mid sized river. A river flowing in a river bed full of razor sharp coral. You fall, you bleed!!. There are no sharks in the lagoon so you won’t be immediately eaten but only if the tide is rising and water comes into the lagoon. The sharks are outside the lagoon waiting for bleeding anglers swept outside on dropping tide. Don’t worry The guides won’t let you die. Payment is at the end of the day ;). Really you have to be careful fishing the reef. On the main island on Rarotonga, on the much more public and accessible reef areas, every year tourists die because they underestimate the current and the impossibility to swim against it. But the fishing on these spots is more than awesome. Totally breathtaking. The coolest thing is that you can see the fish in the waves which is a really cool way of spotting fish. It is not that the fish are swimming in the wave but also because of the refraction you see everything that is underneath the wave. All fish concentrate around the reef gates and its a quiet hectic way of living. There is always something to prey on and even big fish are chased by bigger ones. Another big advantage is that the water is rather turbulent and the fish extremely fired up. Take on the fly comes immediately if you deliver the fly in the fish field of view of the fish. The day of the two lost GTs. It was my second day fishing with ITU. 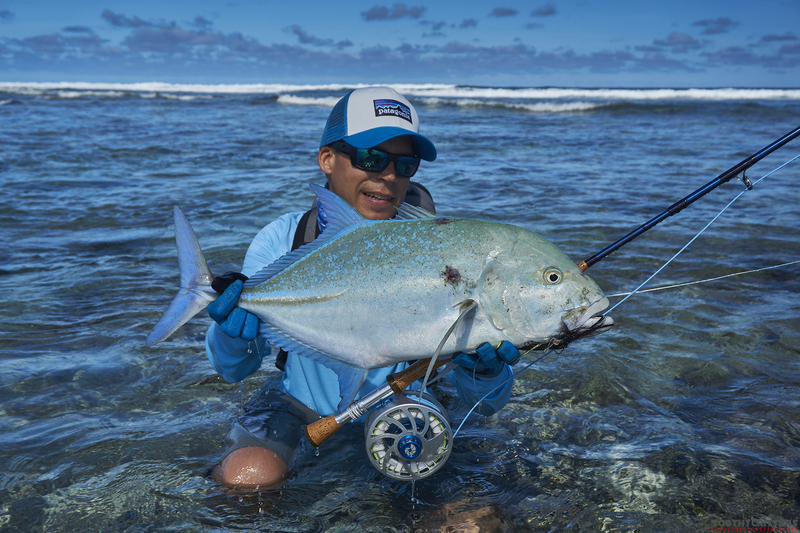 We fished the south side of the atoll in between of two gates and we had already several contacts and caught some nice bluefin trevallies. We walked on the reef when ITU saw a Napoleon wrasse in the surf just 30m way and I was instantly motivated and ran over to the place where he saw the fish. We didn’t saw the Napoleon but a nice GT standing in the waves. We were standing roughly 20m more offshore away from the point were the big waves are breaking. I wasn’t comfortable walking more close to the breaking waves. The weather was calm but still 1 to 1,5m waves. Smaller waves broke just ahead of me and the water was a big frothy from the waves and the fish disappeared visually after each breaking wave. I placed the fly somewhere in front of the fish and after the first strip there was resistance. The GT took the fly. The fish immediately headed for the reef edge trying to cut me off. In such a situation you have to understand that you need to stop the fish before it reaches the backing. Each meter less line out increases the chance to land a GT. No reel drag will stop a GT so I palmed with my hand on the reel literaly blocking it as much as possible. The adrenaline flows. I stopped the fish directly on the reef edge and then the line snapped. The 70 lbs Strong fly line simply snapped in the middle of the running line, not cut on a coral. So painful is GT fishing. I switched to my backup rod and continued fishing. Just a few minutes later another GT took the fly in the frothy water after the surf. What a spectacular fishing. I could have done that for the rest of my live every day. Unfortunately also this fish try to head for the next coral bommie and somehow also managed to cut the leader. 150 pounds of blue water fluoro carbon. Two nice GTs lost within 30min. All not smaller than 40-50 pound. A total disaster and I was disappointed about myself although in such a situation you can’t do much rather than hold on to the fish and hope for the best. The day ended without any further contact to a GT. The story of the land of the giants is not over. There is more to come in the next chapter.